As in any other industry, technology is integrated into our everyday work, from oceanographic studies to biological surveys. Technology advancements are ever increasing the capacity of our underwater discoveries and preservation of our oceans. On some occasions, an entirely new and unique tool must be developed to accommodate the environmental regulatory requirement. Some will go to the lengths and say that tech companies are propelling the environmental movement. However, with the appropriate resources by our side, technologies are ever expanding MBC’s capabilities. Deploying the most relevant and applicable technology is important to each of the projects MBC engages in. Allow us to introduce you to some of our favorite and most functional tools. 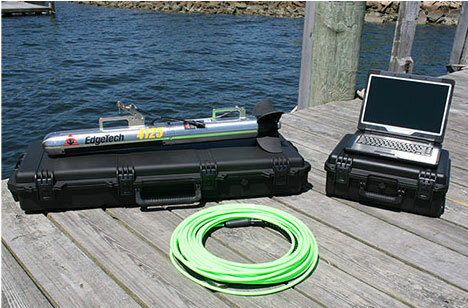 The EdgeTech Model 4125 side-scan sonar is the bread and butter of our tech tools. The sonar is created to visualize the seafloor using acoustic images. EdgeTech began manufacturing side-scan sonars in 1965 as a division of EG&G prior to becoming a private company in 1995. The company’s name, EdgeTech, is in honor of the late Dr. Edgerton, an MIT professor that invented side-scan sonars and founded EG&G. The dual-frequency Model 4125 allows underwater objects to be viewed up-close using the high-resolution 1600 kHz frequency or from afar using the 600 kHz frequency. MBC’s Model 4125 is the most advanced side-scan sonar developed by EdgeTech to date. 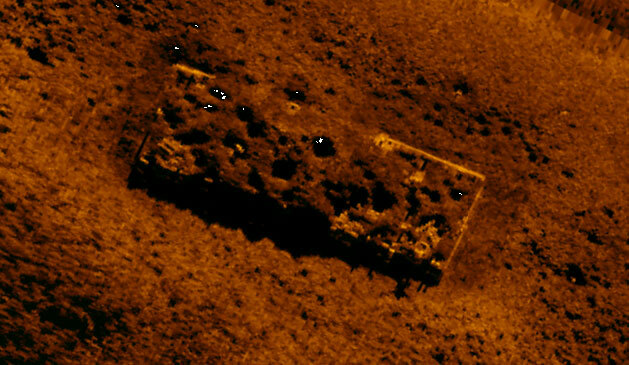 A side-scan is a torpedo-shaped sonar that is towed behind a survey boat to obtain oblique views of the seafloor, similar to an aerial photograph. Within MBC, we’ve utilized the side-scan sonar to locate shipwrecks, search for missing equipment, identify underwater vegetation (kelp, eelgrass, and Caulerpa), and create reef maps. Eelgrass, kelp and Caulerpa surveys, shipwreck surveys, underwater utility surveys and reef surveys all rely on the side scan sonar to produce the appropriate results, falling into the categories of search and recovery, archaeological, vegetation mapping, and utility location projects. Our projects benefiting from the side-scan sonar cross sectors and types. Eelgrass survey in San Dieguito Lagoon: Mapped the location and extent of eelgrass within portions of the lagoon. Underwater utility survey in Oakland Harbor: Determined if the seafloor was suitable for installation of a utility cable. Anchor plan for Hyperion 1-mile Outfall remediation: Provided construction personnel with maps so that large anchors did not disturb or destroy sensitive habitat (such as reefs or kelp beds). Locate sunken barge near Alameda: Surveyed a proposed cable corridor, and located a barge partially buried in the seafloor, adjacent to the cable crossing. What’s the most interesting find with the side scan sonar? MBC Hydrographic Surveyor, Steve Sullivan, would say it’s finding shipwrecks. The side-scan sonar is the only tool in the market with the capabilities to visualize the seafloor. Many different types of marine scientists and engineers use side-scan sonars, including archaeologists, marine biologists, geologists, hydrographic surveyors, utility surveyors, and port engineers. Every year, the industry requires a higher resolution of seafloor objects. EDGETECH has continued to keep up with the demand by manufacturing high-frequency side-scan sonars that allow seafloor objects to be viewed at high resolution, or from afar. MBC owns some incredibly powerful oceanographic sensors, called Acoustic Doppler Current Profilers (ADCPs), which have the capability to measure and monitor both the speed and direction of ocean currents from afar. MBC’s ADCPs are manufactured by Teledyne RD Instruments, the first company to introduce ADCP technology to the marine community in 1982. Similar to the doppler radar used by weathermen to track water droplets in storm clouds, an ADCP uses acoustic beams to track the speed and direction of small objects (plankton, silt, debris) carried by ocean currents. Most often, this tool is used for oceanographic investigations including power plant and desalination projects, in addition to impingement/entrainment and baseline studies, across long periods of time. MBC has the capabilities to set up an ADCP on the seafloor to measure currents at equal intervals, all of the way up to the surface. Alternatively, the device can be mounted on a piling to measure the currents bank-to-bank. Even more, we can install the ADCP on our boat for measuring currents from the surface to the seafloor along entire tracklines. The Oceanside desalination investigation benefited from the ADCP by characterizing nearshore currents, which would drive dispersion of the desalination discharge. 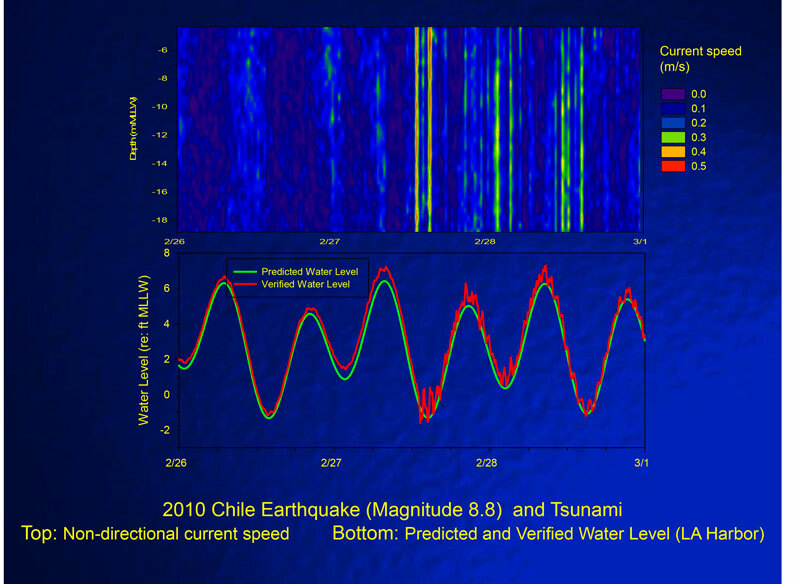 The ADCP installed in the Port of Long Beach during the 2010 Chilean earthquake and subsequent tsunami tracked the current speed and water level at the Port of Los Angeles tide gage. To this day, no other technology permits the remote monitoring of ocean currents through the entire water column. MBC uses the classic Bongo net to sample zooplankton, and eggs and larvae of fishes and invertebrates. The Bongo net was originally developed in 1980 by the National Marine Fisheries Service (NMFS) for use in the Marine Resources Monitoring, Assessment, and Prediction (MARMAP) program. The Bongo net consists of two cylindrical collars of 2’-diameter, connected with a yoke, and as you would guess, is named for its resemblance to bongo drums. The paired plankton nets provide replicate sampling using mesh sizes ranging from 10 to 1000 microns, dependent upon the desired organisms to be collected. A Bongo net is the best tool for sampling zooplankton as it is large enough to effectively filter water with no tow harness or other front obstructions to frighten, disturb or damage the catch. While the net was designed to standardize zooplankton sampling in order to design a base for result analysis, MBC commonly uses the Bongo for intake and entrainment studies, as well as baseline investigations for quarterly power plant and desalination studies. 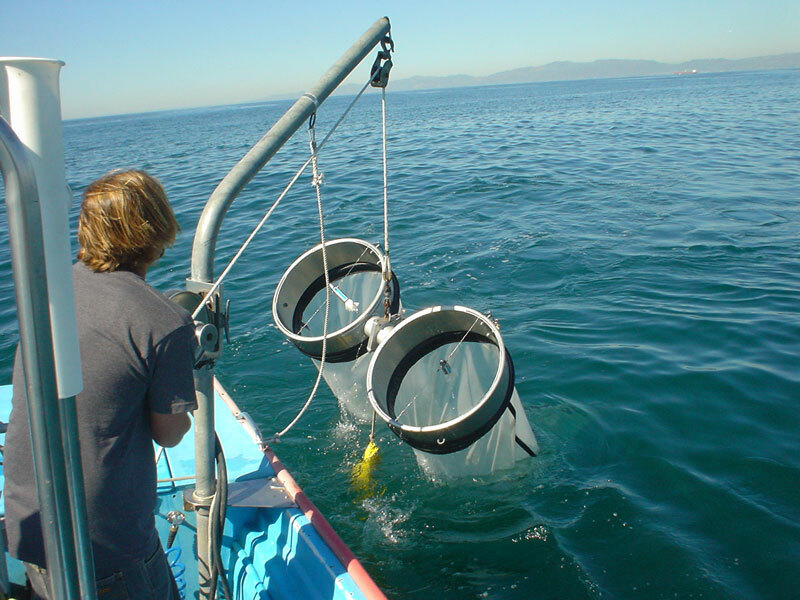 MBC conducted year-long plankton studies using bongo nets at most of southern California's coastal power plants in 2006. The data were used to estimate the loss of plankton due to operation of the cooling systems at each facility. We’re unlikely to see many changes to the BONGO net in the coming years, as it is a standard tool in marine biology and, if you ask us, is certainly living up to its expectations. MBC’s most incredible tool is a Geometrics Model 882 marine magnetometer, in which we use to locate ferrous (iron) objects buried beneath the seafloor. MBC conducts “marine magnetometer surveys” in support of marine archaeologists searching for shipwrecks, engineers searching for underwater utility lines, and shipowners seeking lost anchors. 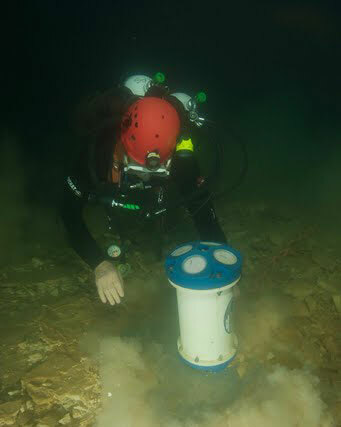 Any underwater ferrous metal object will cause a “magnetic anomaly” (i.e., a local variation in the Earth’s magnetic field) that can be detected by a marine magnetometer. Geometrics was founded in 1969 (same year as MBC), purchased by EG&G in 1976, and acquired by OYO (a Japanese geotechnical firm) in 1997. MBC conducts magnetometer surveys by towing a Geometrics Model 882 magnetometer sensor as close to the seafloor as possible, and, consistently at least 100’ behind the survey boat, so that the magnetic data is not contaminated by the ferrous metal on the vessel. Towing the magnetometer sensor close to the ferrous object is key as the anomaly is reduced by a factor of 8 when the distance between the sensor and object doubles. For example, the marine magnetometer can detect a 1-gamma magnetic anomaly that is caused by 1-pound of iron at 10’ from the sensor, or by 1-ton of iron at 100’ from the sensor. Although used infrequently, hydrographic and geophysical surveys are the most common use of the Model 882, including archaeological and underwater utility surveys, as well as shipwreck searches. 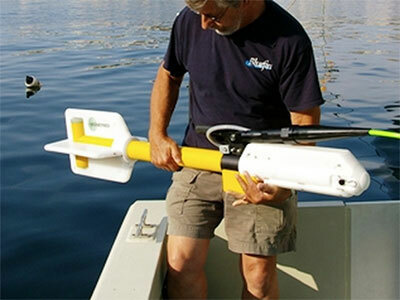 MBC is an expert at using a marine magnetometer to locate underwater, buried objects. For example, MBC conducted a magnetometer survey offshore of Mandalay Generating Station in Ventura and located eight buried anchors that were subsequently recovered. MBC has also used magnetometers to locate historic shipwrecks, gas pipelines, lost equipment and other seafloor objects containing ferrous metal. The Underwater Utility Survey across Oakland Harbor benefited from the 882 by verifying that no buried pipelines, cables, or other utilities would interfere with installing a new waterline across Oakland Harbor. 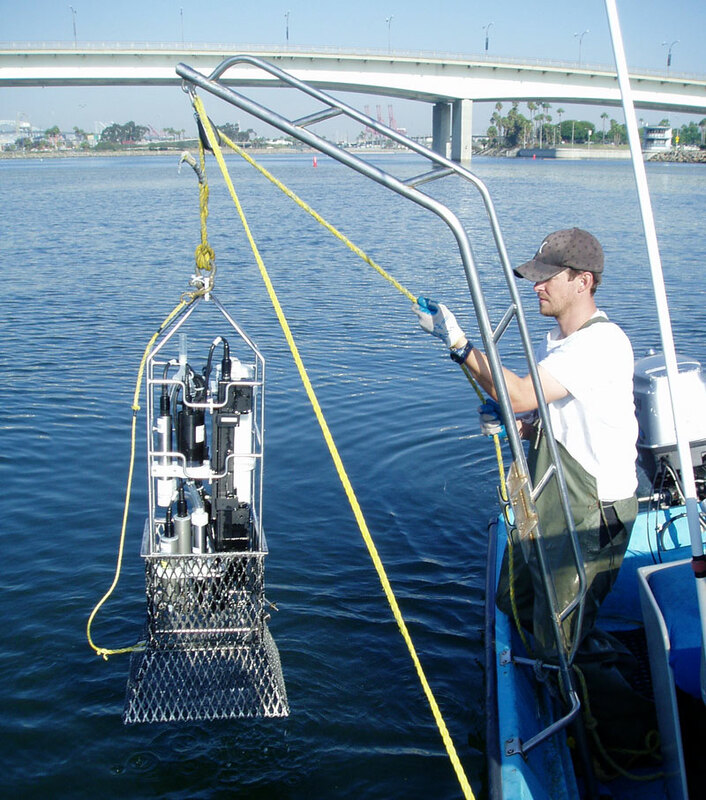 MBC’s most frequently used tool is our Sea-Bird Model SBE-19 CTD that MBC uses for weekly, monthly and quarterly water quality profiling offshore of coastal power plants between Ventura and San Diego. The CTD (conductivity, temperature, and depth) profiler is a package of electronic instruments that is vertically deployed through the water column to digitally-measure oceanographic parameters. In addition to measuring the CTD parameters, the SBE-19 also measures dissolved oxygen, fluorescence, transmissivity, and nutrients. The CTD system was created by Neil Brown in the 1950’s to vertically profile the water column while simultaneously collecting digital oceanographic parameter data in Australia. Neil eventually moved to the U.S. and worked for Woods Hole Oceanographic Institution. We’re constantly experimenting with new tools that will both simplify the processes and provide better outcomes for our clients. Do you have a project that could benefit from MBC’s expertise with these tools? We’d love to hear about it.